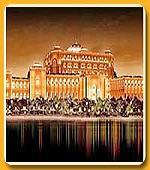 Emirates Palace is most aptly named as it is built like an Arabian Palace. It is probably Abu Dhabi's most Middle East's one of the most luxurious hotels. The architecture of the hotel is worth giving a look. It is made of 114 domes topped by mosaic glass tiles and crowned by gold finials. Spread over 200 hectares of manicured gardens; the hotel is located on the beguiling beach equipped with leisure facilities. Emirates Palace offers most luxurious rooms to spend the days on vacation or business with the option of garden view, pool view or ocean view. Select from 302 rooms including 92 suites. The décor of the rooms are done in traditional regal style with latest touch screen technology for electronic appliances. Luxurious bathrooms, free access to gym and spa daily replenishment of mineral water and fruit basket comes with the room. Pearl Rooms offer in addition butler service and flowers and a bottle of wine on arrival. Diamond Rooms offers in addition beverages and snacks in the guest room and access to the Diamond Lounge throughout the day. Dine at any of the five restaurants of Emirates Palace to get the taste of the world. Cascades is situated near the Water Park where you can enjoy lots of recreational activities with your family along with breakfast, lunch and afternoon snacks. For International a la carte menu or Oriental buffet, try Le Vendome Brasserie. Try the Mediterranean cuisine at Mezzaluna. Check out the Asian and Pacific Seafood recipes at Sayad prepared to your satisfaction by our renowned chef who will become your personal cooks. Enjoy al fresco dining with salads and grills for the lunch and innovative new recipes for the dinner prepared by our personal island chef at Las Brisas. Al Majlis is the bar with a selection of the best drinks from all over the world. Havana Club is the men's cigar lounge with collection of finest cognacs, armagnacs and cigars. Savor the steaming cup of coffee, fragrant teas, home made pastries, creamy cakes, fresh sandwiches for breakfast or with evening tea at the Café. Palace Ceremony is the exclusive restaurant where you are the only guest and the chef is ready to prepare gourmet's fare for you. Whether it is a large convention of 1000 people or a small intimate gathering, Emirates palace arranges for all. There is a grand ballroom and 48 meeting rooms to fulfill all you requirements. Conferencing aids like video conferencing, projectors, plasma television, special lighting and IP cameras are there to enhance your presentations. Emirates Palace feature two Spas so that you do not miss out on your fitness schedule. Fit for kings and queens, the spa is located in the east and west wings. You will find a long list of luxury line of beauty products. Enjoy the tranquility of the longest private beach in Abu Dhabi. 1.3 km of beach with golden sands and 2 swimming pools are for you to indulge in. Other facilities at Emirates Palace include luxury jewelry shop and fashion mart. This Site is Designed, Developed & Maintained by Compare Infobase Limited.